The preterite tense in Spanish normally describes events which are both in the past and completed, or at least described as beginning in the past. Correct translation of the English means deciding which sense of the past is implied. Note that these same endings also apply to regular –er verbs as well. Some verbs take what is known as ‘pretérito grave’. The first and third preterite endings are not stressed, and have no accent. Additionally, the stem of the preterite is usually unpredictable. 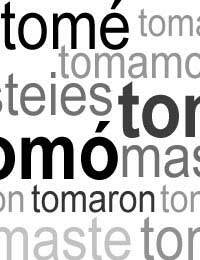 Note that when the stem of ‘pretérito grave’ ends in ‘j’, the third person plural ending is –eron. The first sentence looks back on the crossing as accomplished, the second envisages the crossing as still to be made. Ayer anduve más de quince kilómetro - Yesterday, I walked more than 15 kilometres. Fue un error no devolverle el dinero - It was a mistake not to return the money to him. La fiesta fue un éxito muy grande - The party was a great success. If a finite period of time in the past is mentioned, i.e. a period of time of a specific length, then you must use the preterite tense for any event which went on the for the duration of the period, and then ended. Note that a period of time is often implied rather than explicit. Por un instante, pensé que me caía - For a moment, I thought that I was falling. Durante meses o pudimos hablar de otra cosa - For months, we couldn’t talk about anything else. In sentences with phrases like ‘todos los años’ (every year) or ‘todos los días’ (every day), the beginning and ending of the period of time are not specified, and so you should use the imperfect. Some verbs undergo a change of meaning according to aspect. This is especially true of saber (to know), poder (to be able to), tener (to have) querer (to love/want), and conocer (to know a person). Pudo hacerlo - He/She/You (formal) managed to do it. Supe que no era cierto - I found out/realised it wasn’t true. Some typos on this otherwise excellent page: "Ponder" for poder and "fu" for fui. You need a proofreader.